March 1, 2017 — Links International Journal of Socialist Renewal reposted from Historical Materialism — Assessing Bolshevik policy before Lenin’s return to Russia in April 1917 has long been one of the most heated historiographic controversies in the socialist movement. As Frederick Corney’s recent documentary collection has illustrated, debates over this issue were a central component of the political struggle waged in the early 1920s by Leon Trotsky and his supporters against the degeneration of the Soviet regime under the leadership of Joseph Stalin. Over the coming years and decades, polemical assessments of early 1917 Bolshevism crystallised into points of principle. Faced with the degeneration of the Soviet state and the Communist International, it is not surprising that anti-Stalinist Marxists upholding internationalism and workers’ democracy generally re-affirmed Trotsky’s analysis of early 1917. This dynamic has continued up to the present. John Marot, for instance, has sought in a recent set of polemics against Lars Lih to defend the traditional case for a ‘sea change’ in Bolshevik strategy in April. Unfortunately, Trotsky’s account obscures more than it clarifies. Contrary to his claims, the Bolsheviks did in fact aim to seize power well before Lenin’s return. That this fact has been so widely overlooked testifies to an on-going analytical confusion surrounding the politics of ‘old Bolshevism’ and revolutionary social democracy. Crucially, the Bolsheviks did not believe that setting up a workers’ and peasants’ government in Russia was justified only during a socialist revolution. In their view, such a regime was needed to lead the democratic revolution to victory – to confiscate the landed estates, pass the eight-hour day, establish a democratic republic, etc. Building off the pioneering work of Lars Lih, I will show in this article – the first in a series on the evolution of Bolshevism in 1917 – how ‘old Bolshevism’ was articulated and implemented in the February Revolution. Though they did not think that Russia on its own was ripe for overturning capitalism, Bolsheviks called for a proletarian-peasant government to end the war, to meet the people’s demands for land and bread, and to spark the international socialist revolution (which would, in turn, allow Russia to establish socialism). This was the party’s general stance both in the February Revolution and in March, i.e., after the Tsar’s overthrow. Bolshevik strategy certainly evolved during and following April. But the party’s longstanding orientation – indisputably distinct from Menshevism – constituted the foundation for its militancy throughout 1917. Given the complexities of the post-Tsarist political situation, it is not surprising that there were sharp tactical debates among Bolsheviks during these early months – and throughout 1917. A certain conception of the driving forces of the revolution did not provide easy answers to the challenging tactical questions posed day-by-day – or even hour-by-hour – in the whirlwind of revolution. Even with the benefit of hindsight it is often far from clear which tactic was best suited for the particular moment. That said, a strong case can be made that the party’s practice across the empire before Lenin’s return was in fact marked by serious waverings, which Lih has sometimes underestimated. This was mostly the case in March, as will be discussed in the next article in this series. But Bolshevik behaviour in February too was marked by some significant vacillations. Lenin’s arrival in April played an important role in pushing the party in a more politically resolute direction. But it does not follow that early Bolshevik wavering was primarily caused by flaws in the party’s strategic line of march. Much of this vacillation took place in spite of (rather than because of) the overall orientation of ‘old Bolshevism’. The reason why it is important to re-examine the February-March debates goes beyond just setting the historical record straight. Understanding the politics of ‘old Bolshevism’ is crucial to overcoming the widespread tendency to conflate Lenin’s politics with those of the party as a whole in 1917. It is hardly the case that Lenin’s position always prevailed even in Petrograd after April. This dynamic becomes far more evident in the provincial towns and outlying regions of the empire, where the political and organisational attachment of the local committees to Lenin and the Petrograd-based leadership was often tenuous. Historian Hugh Phillips, for example, observes that ‘Tver's archives confirm the absence of a national Bolshevik network in 1917 taking its commands from the leadership in Petrograd. In short, the city's Bolsheviks were largely on their own.’ The autonomous perspectives and actions of local Bolshevik leaderships were often decisive well into 1918. Without understanding the Bolshevik party’s longstanding strategic cohesiveness, it is hard to make sense of how and why it came to become the leading socialist current in so many regions of imperial Russia by October. One hundred years after the revolution, it is well past time for Marxists to take a fresh look at what Bolsheviks said and did on the ground in 1917. Before delving into the theory and practice of Bolshevism, it may be helpful to briefly sketch out the basic sequence of the February upheaval. Revolution erupted in the heart of imperial Russia on International Women’s Day (23 February in the old calendar). 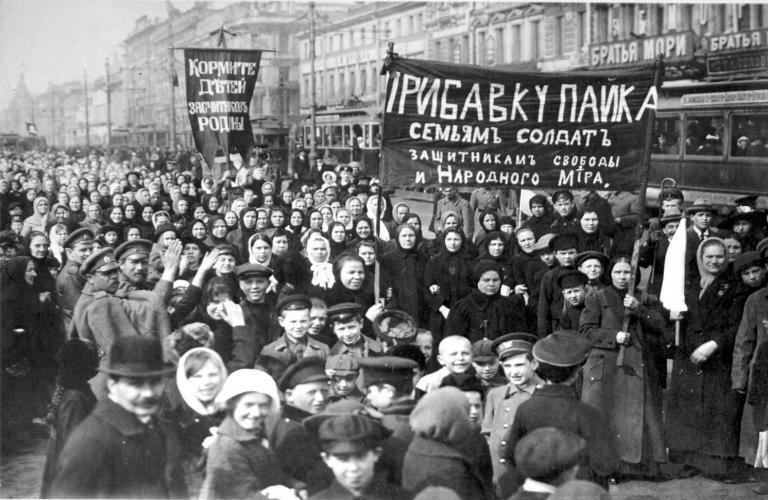 Working-class women in Petrograd struck, took to the streets to demand bread, and called upon workers in their neighbouring workplaces to join in. Hundreds of thousands of workers took to the streets the following day and by 25 February the capital was paralysed by a general strike. On 26 February, the state ordered troops to fire upon the protestors: some units complied, killing hundreds. Soldiers’ mutinies spread that evening and the following morning, culminating in the implosion of the city’s military apparatus on 27 February. Up until this point liberal leaders in the State Duma had limited their actions to calling on the Tsar to reform his government. Only on 27 February did the liberals finally side with the revolution, though they simultaneously sought to preserve the monarchy. 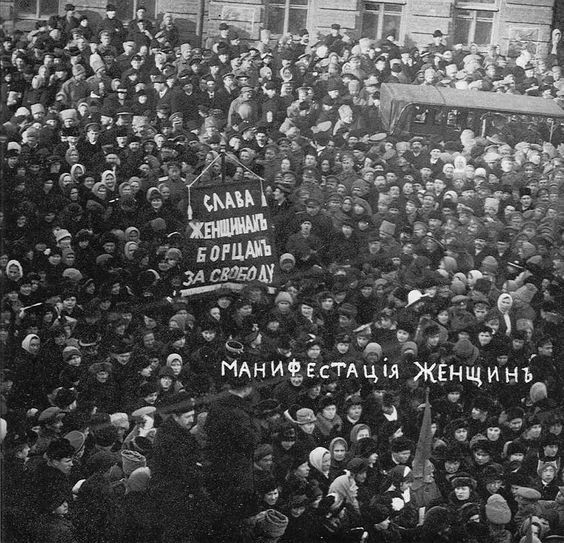 The Tsar abdicated on 2 March and called upon his younger brother to take the throne – yet protests from workers and socialists against the preservation of the monarchy obliged the latter to step down as well. After a reign of more than three hundred years, the much-hated Romanov regime had been toppled by working people. What should replace Tsarism? Moderate and radical socialists gave very different answers to this question during the February Revolution. Indeed, the course of events in Petrograd was inseparable from conflicts between different socialist currents over the fundamental strategic choice of 1917: whether to promote the hegemony of the proletariat or an alliance with the bourgeoisie. Whereas moderates sought to channel the upsurge into a bloc with the liberal State Duma, radicals upheld the tradition of 1905 and called for the establishment of a provisional revolutionary government of working people, with no participation of the propertied classes. The ability of the moderate socialists to impose their vision was decisive for the particular shape of the power that replaced Tsarism. By 27 February, Tsarist authority had collapsed, and the liberal Duma was left floating in mid-air with little support on the ground. Since the insurgent workers and soldiers looked to the new Petrograd Soviet as the legitimate authority, it easily could have taken full power had it been so inclined. During the first days of insurrection, the radicals – Bolsheviks, ‘Interdistrict’ Marxists, and left Socialist Revolutionaries (SRs) – had held the initiative. But their call on workers to gather at the Finland Station to form a soviet and their own provisional revolutionary government fell flat. Instead, the insurgent crowds responded to the moderate socialists’ rival proposal to form a soviet at the Tauride Palace (where the liberal State Duma was based). The Menshevik leaders of the new Soviet were intent on a bloc with the liberals: only such an alliance, they argued, could prevent a successful counter-revolution – conditions in Russia, moreover, were unripe for a working-class regime. At the first session of the Soviet, on 27 February, the moderates thus proposed the establishment of a purely bourgeois government through negotiations with the liberal leaders. At the same time, however, the Soviet leadership distrusted the liberals and worried about losing its hold over the radicalised workers and soldiers. Thus it sought to maintain a significant amount of power in its own hands, so as to pressure the bourgeoisie to implement the people’s wishes. Crucially, the Soviet’s famous 1 March ‘Order Number 1’ declared that soldiers must only follow governmental political instructions that were also approved by the Soviet. The fruit of this approach was the ambiguous structure of ‘dual power’. Menshevik and liberal leaders met on the evening of 1 March. The latter were obliged to accept the Soviet leadership’s terms for its conditional support, the most important of which were that the Provisional Government grant political freedom and legal equality for all, abolish the police and establish a people’s militia, release all political prisoners, refrain from reprisals against mutinous soldiers, and convoke a Constituent Assembly as soon as possible. (Significantly, the crucial questions of war and land reform were absent from the agreement.) On 2 March, the Soviet overwhelmingly accepted the leadership’s resolution to support the government in so far as it implemented the demands of the people. The immediate urgent task of the Provisional Revolutionary Government is to establish relations with the proletariat of the belligerent countries with a view to the struggle of the proletariat of all countries against their oppressors and their slave masters, against the Governments of Tsarist type and the Capitalist cliques, and with a view to the immediate cessation of the bloody slaughter inflicted on the enslaved people. The workers of the factories and plants as well as the insurgent troops must choose, without delay, their representatives to the Provisional Revolutionary Government which must be established by the Revolutionary Insurgent people and the Army. … Forward! There is no turning back! Fight without mercy! Follow the Red Flag of the Revolution! Long live the Democratic Republic! Long live the Revolutionary working class! Comrades, the long-awaited hour has arrived! The people are taking power into their own hands, the revolution has begun; do not lose a single moment, create a Provisional Revolutionary Government today. Only organisation can strengthen our forces. First of all, elect deputies, have them make contact with one another and create, under the protection of the armed forces, a Soviet of Deputies. Bring over to our side all soldiers still lagging behind, go to the barracks themselves and summon them. Let Finland Station be the centre where the revolutionary headquarters will gather. Seize all buildings that can serve as strongholds for our struggle. Comrade soldiers and workers! Elect deputies, forge them into an organisation for the victory over autocracy! The Russian Revolution – taking place in the midst of the world conflict [WWI] and in the era of a colossal intensification of class contradictions in the West – will give a new push to the upsurge in proletarian struggle in the countries of finance capital for the full expropriation of the capitalist class. The Russian Social Democracy must strive to ensure that the democratic revolution in Russia serves as the signal for the proletarian revolution in the West and it must call on all internationalists in the warring countries to coordinate their actions to fight capitalism. Who besides workers can stop the production of cannon and shells and end the carnage? Who else can raise high the glorious banner of the Russian Revolution? The final denouement is near, as is the final judgment on the perpetrators of the greatest crime in history against mankind. … There have been enough victims for the glory of Capital. Our common enemy is behind our backs. The Bolsheviks’ orientation, in short, was very radical. That they did not project the perspective of overthrowing capitalism in Russia prior to the Western workers’ revolution did not stop them from calling for a proletarian-peasant government to end the war, meet the people’s social demands, and spark the international overthrow of capitalism. Bolshevik tactics regarding the creation of a revolutionary regime, in contrast, were generally cautious during late February and early March. From 27 February onwards, the party did not in practice fight for power. Though the district Bolshevik Vyborg Committee advocated a more offensive tactic, the top Petrograd party leadership – the Russian Bureau of the Central Committee led by Alexander Shlyapnikov – felt that conditions were not yet ripe for such an approach. Initially, in the first days of the insurrection, all wings of Bolsheviks had sought for the party committees to directly lead the overthrow of the autocracy and to take the initiative in establishing a broader revolutionary provisional government. Shlyapnikov recalls that on 25 February ‘we decided that the time for diplomatic negotiations and agreements [with the moderate socialists] had already passed’; instead, the mass movement should be led by ‘our battle-proven, disciplined, and centralised party groups’. The 27 February proclamations by the Russian Bureau and the Vyborg Committee reflected this desire to assert Bolshevik (and/or radical) political hegemony, against the attempts of the moderate socialists to do the same. But, as we have seen, the radicals lost the battle on 27 February when the moderates succeeded in leading the masses to the Tauride Palace. not even think of engaging in any real struggle for their principles, either in the [Soviet] Ex. [ecutive] Com. [mittee] or the Soviet, or amongst the masses. When the question was debated these people were almost unnoticeable; they never came forward with an independent formulation of their position, and when it came to voting they constituted a single majority with the representatives of the third tendency [in favour of ‘dual power’ and the recognition of the Provisional Government]. On 1 March, the radical Vyborg Committee proposed that the Bolsheviks push for the Soviet to establish itself as the government, but Shlyapnikov and the city’s other top Bolsheviks felt that this initiative was premature. Other sources, however, have painted a different picture. Historian Ziva Galili, for example, concludes that in late February ‘apart from a small group in Vyborg – the most militant of the working-class districts – workers did not appear ready to take responsibility for the country as a whole.’ For further evidence of relatively moderate mass sentiment, we could point to two more salient facts: workers flocked to the Tauride Palace rather than the Finland station on 27 February and radicals subsequently found themselves outnumbered in the early Soviet sessions. Moreover, it is far from evident that a revolutionary government in Petrograd would have found sufficient support among workers and soldiers outside the capital, where political polarisation at this moment was much less developed. In view of the fact that the Provisional Government is organized by antipeople circles and landlords of Guchkov’s type, whom the revolutionary workers and soldiers cannot trust, we protest against every attempt at agreement [with them]. We express no confidence in Kerenskii. Also we recognize that only the Provisional Revolutionary Government can fulfil the popular demands. Yet many Bolsheviks failed to support the line of their own party. Various Bolshevik leaders limited their interventions to calling on the Provisional Government to implement the people’s demands for a republic, elections in the army, and the eight-hour day. In the end, only 14 delegates voted for the radicals’ resolution, despite the fact that there were at least 40 Bolsheviks present. Moreover, a majority of Bolshevik delegates voted in favour of the Soviet leadership’s proposal to recognise the Provisional Government. In the party leadership meetings that evening and the following day, a minority of the most radical Bolsheviks demanded immediate mass agitation for an armed uprising against the Provisional Government. But this perspective was defeated, as the majority of local Bolshevik heads now believed that establishing a revolutionary provisional government had become a mid-range, rather than immediate, objective. Sharp debates over how and when to replace the Provisional Government – as well as divergences concerning how much it (and the moderate socialists) could be pressured from below – continued in all levels and regions of the Bolshevik party throughout the rest of March. An assessment of Bolshevik policy and practice in February must answer two distinct questions. First, since the Bolsheviks advocated a workers’ and peasants’ government, why did they not fight for this in practice after the victory of the 27 February insurrection? Second, why did so many Bolsheviks hesitate to defend their own party’s political line during the crucial debates in the Soviet? Readers should note that the Bolsheviks’ explanations for their approach rarely related to ideological concerns – instead, questions of tactics, organisation, and assessments of the conjuncture were generally seen to be paramount. When the Soviet of deputies was formed – then state power was proposed, but the workers did not consider it possible to take power into their hands ... Did the Soviet of Workers' Deputies act correctly in refusing power? I consider that it did. To take power into our hands would have been an unsuccessful policy, since Petrograd is not all of Russia. There, in Russia, is a different correlation of forces. there could be no question of leading the masses to the final battle. The party had been decimated in the recent period by countless arrests of its members ... Especially in the first days of the movement, the disorganisation was terrible, a circumstance that the various opportunistic leaderships took advantage of. Along the same lines, Bolshevik worker S. Skalov posited that ‘we could not go against the Duma on 27 February 1917, nor was there any reason to. We were too weak organisationally, our leading comrades were in jails, exile and emigration.’ Shlyapnikov’s memoir also consistently stressed the Bolsheviks’ ‘weakness’ and the ‘hostility’ directed at them inside the mass struggle and the Soviet, which made asserting their politics ‘a daunting job’. If the Bolsheviks were indeed this weak and politically isolated, then the Vyborg Committee’s desire to push for a soviet government (including through immediate armed struggle) should probably be seen as an expression of ultra-left Blanquism. Over the coming months, Bolshevik leaders, including Lenin, would have to frequently push back against the tendency of the Vyborg Committee and other Bolshevik radicals to fight for power before a majority of the Soviet was won to this position. Another possible explanation for Bolshevik cautiousness in February is that various party members felt that the danger of immanent counter-revolution obliged limited cooperation with the liberal elite. During the upheaval, a fear that right-wing generals would march on Petrograd to depose a new revolutionary government was one of the central factors pushing the Soviet leadership into seeking a legitimising bloc with the propertied classes. As Hasegawa notes, this fear was not misplaced; the perceived threat was in fact a very real one. Alistair Dickins’ recent work on the Siberian town of Krasnoiarsk has shown that even in this soon-to-become bastion of radicalism, the Bolsheviks in early March collaborated with the liberals due to their ‘fears … of a possible counter offensive by regime loyalists.’ According to one secondary source, this may also have been a factor shaping Shlyapnikov’s behaviour in the February Revolution. Finally, we should take note of one factor that was tied to deeper ideological-strategic questions: how to relate to moderate socialists in the fight to establish a new power. Potential tensions in ‘old Bolshevik’ strategy – which stressed both the hegemony of the proletariat and the need for a governmental bloc with the ‘revolutionary democracy’ – revealed themselves in late February when the Mensheviks and SRs won the leadership of the insurgency away from the radicals and then sought to hand power to the liberals. Traditionally the Bolsheviks had envisioned that the Marxist proletarian party would lead the seizure of power and establish a democratic dictatorship of the workers and peasantry. This was often portrayed as a coalition between the Russian Social Democracy and the ‘revolutionary democratic’ parties of the peasantry and petty-bourgeoisie (the SRs, etc.). Which social class and party, if any, should be the dominant current in the revolutionary government was left open-ended. In such an unforeseen context, venturing down the intransigent political path desired by the Vyborg Committee had the benefit of clearly upholding proletarian hegemony, but it dangerously risked breaking ties with the ‘petty-bourgeois’ parties and their class constituencies. The question of whether the SRs and Mensheviks could be convinced (or cajoled) to break with the bourgeoisie had major practical implications and it remained an on-going debate in the Bolshevik party throughout 1917. But it is important to note that the radical Vyborg Bolsheviks were no less committed to the strategy and perspective of ‘old Bolshevism’ than more cautious leaders like Shlyapnikov. The algebraic character of the ‘democratic dictatorship’ strategy (with its dual stress on proletarian leadership and ‘democratic’ alliances) could be developed and concretised in distinct directions. A strong tradition of sharply criticising moderate socialists and asserting Bolshevik political hegemony was no less important to the party’s theory and practice than its search for unity – under working-class leadership – with the non-proletarian masses and their representatives. In February, as in subsequent months, Bolsheviks could and did lean on different elements of their party’s strategic heritage to navigate the stormy revolutionary seas. And when it became clear to Bolshevik militants such as Shlyapnikov that the moderate socialists would not break from the bourgeoisie, most promptly adjusted their tactics accordingly. The aforementioned factors explain why the Bolsheviks did not immediately fight in practice for soviet power in February. But what explains the reticence of so many of their militants to affirm their party’s call to reject the new liberal regime and eventually establish a provisional revolutionary government? This was a significant political adaptation. As would be the case in March, wings of the Bolshevik party hesitated to publicly defend the stance of ‘old Bolshevism’ – as Sukhanov put it, the Bolsheviks failed to engage in a ‘real struggle for their principles’. Ambiguities in the strategy of ‘old Bolshevism’ itself may also have contributed to these hesitations. It was understandable that Bolshevik militants who envisioned the establishment of a revolutionary government through an agreement with the Mensheviks and SRs might be wary of engaging in a sharp political battle that could lead to a rupture with these necessary allies. By way of conclusion, three points should be underscored in relation to Bolshevik theory and practice in the February Revolution. First, the party’s strategic perspective was unquestionably militant well before Lenin’s return. Bolsheviks rejected blocs with liberals, denounced the war, demanded land to the peasants, and called for a revolutionary government based on the Soviet. The overthrow of the Tsar had not accomplished these fundamental objectives – the democratic revolution, in Bolshevik eyes, had not yet been completed. As such, even after the downfall of the autocracy, the top party leadership in March continued to uphold the general strategic orientation raised in February. Adherence to the tenets outlined above constituted the ‘red thread’ of political continuity for Bolshevism throughout 1917. So too did the party’s stress on immanent world socialist revolution. Though Lenin in April raised the relatively modest perspective of ‘steps to socialism’ (which crucially did not include the expropriation of capitalist industry) in Russia, all wings of the party well after April continued to believe that the survival and development of the Russian Revolution – both in the immediate and long term – absolutely depended on the success of the revolution abroad. Ironically, Trotskyist accounts stressing that the party was ‘re-armed’ by Lenin in April discount the centrality of international revolution in ‘old Bolshevik’ strategy and exaggerate the extent to which the post-April Bolsheviks in 1917 believed that Russia on its own could move to socialism. The real rupture in Bolshevik strategy, in my view, was the innovation of ‘socialism in one country’. Read our first document during the Revolution, the [27 February] manifesto of our party, and you will see that our picture of the revolution and our tactics did not diverge from the theses of comrade Lenin. Of course, the picture sketched out by comrade Lenin is whole, complete, but its method of thinking is that of an Old Bolshevik, which can cope with the originalities of this revolution. As a ‘conservative’ I confirm that our old Bolshevik method is quite suitable for the present time and I do not see any significant differences between us and comrade Lenin. Bolshevism’s relative political cohesion during 1917 cannot be plausibly explained by the personal influence of Lenin, nor by the party’s organisational structure, which hardly resembled the hyper-centralised and disciplined monolith depicted in both Cold War and Stalinist historiography. ‘Insubordination was the rule of the day whenever lower-party bodies thought questions of importance were at stake,’ notes Robert Service. Indeed, Lenin’s stance on national liberation was more often than not openly rejected by borderland Bolshevik organisations as late as 1918. Some aspects of his April Theses (e.g., framing soviet power as a ‘step towards socialism’ or the highest form of democratic rule) were also ignored on the ground by many Bolshevik committees during 1917. Yet on the most important political questions – proletarian hegemony, opposition to the war, soviet power, land to the peasants – a fundamental continuity marked the politics of Bolshevism before and after Lenin’s return. Lenin’s interventions from April onwards were certainly important in pushing the party as a whole to more aggressively fight against the Provisional Government and to more consistently steer towards a revolutionary regime in which the proletariat and the Bolsheviks would be the dominant force. In practice, this helped orient the Bolsheviks to independently vie for political power and to more antagonistically approach the moderate socialists. Debates over armed insurrection and revolutionary government in October would show just how decisive these questions could be for Marxist practice. But, in sharp contrast with the Socialist Revolutionaries and Mensheviks, Bolshevism did not suffer a major split over the fundamental questions of internationalism and power in 1917. This dynamic can only be understood if we acknowledge the actual politics of ‘old Bolshevism’. Second, despite their shared political radicalism, the Bolsheviks in February were often quite divided on the best tactics to pursue regarding the fight for a revolutionary regime. Whereas the Vyborg Committee wanted to push directly for a soviet government, the tactics of the Bolshevik city leadership in February were generally cautious. It is not self-evident even in hindsight if this caution reflected an ‘opportunist’ political adaptation or whether it was an appropriate approach for the prevailing political conditions (majority support for the moderate socialists, weak Bolshevik party organisation, the isolation of Petrograd, etc.) Precisely assessing this is impossible since the potentialities and limits of popular militancy in February could only have been tested and revealed by a pro-active initiative by the radicals to fight for power. My impression is that while the radicals probably could have seized state power in Petrograd, such a step would have been a tactical blunder since they likely lacked the strength to hold onto it. As such, Shlyapnikov and co.’s cautious tactics were probably the best suited for the existing context. At the same time, however, a strong case can be made that the Bolsheviks did in fact needlessly bend to outside political forces, not least of which was the moderate Soviet leadership. Particularly if the mood from below was as radical as Sukhanov, Hasegawa, and Melancon have described, then it would seem that the Bolsheviks missed a major opportunity to openly advocate for their position. Even if they believed that a soviet regime was not on the immediate agenda, the Bolsheviks still could have argued earlier and harder for a revolutionary soviet government as a medium-term goal. Doing so, at the very least, would have more clearly differentiated themselves from the moderate leadership and would have begun the process of cohering around them the most militant revolutionary workers and soldiers. The fact that so many Bolsheviks voted against their own resolution on 2 March underscores the extent to which party members were swept along with the prevailing political tide. Last but not least, the sharp internal Bolshevik debates over tactics in February illustrates that there was no automatic, one-to-one relation between theory and practice. Despite their party’s shared strategy, Bolshevik leaders frequently advocated a range of distinct tactics at a given moment. All too often, writers have depicted the actions of socialists in 1917 as determined solely by ideology – according to this logic, if Bolshevik tactics were wrong before Lenin’s return it must have been primarily because the party adhered to a flawed revolutionary theory. Along similar lines, the actions of the moderate socialists in February have frequently been explained as if they were solely determined by a particular theory of ‘bourgeois-democratic’ revolution. Detailed histories of 1917, however, have revealed the extent to which more immediate concerns shaped socialist behaviour. SR leader Victor Chernov was only slightly exaggerating when he argued that ‘neither theory nor doctrine triumphed in the ranks of the Soviet democracy’ in February. Concrete assessments of the immediate circumstances and demands of the moment often weighed just as much as ideological considerations. How to steer the best possible political course in the midst of a fluid and unpredictable popular upheaval was always a challenge – here the role of party leaderships, and individual leaders, was crucial. All political currents were subjected to tremendous centrifugal pressures throughout 1917, and socialists in the heat of the moment frequently reversed their longstanding political stances or quietly refrained from fighting for them in practice. The extent to which this dynamic helps explain Bolshevik behaviour in March 1917 will be examined in our subsequent article. Burdzhalov, E. N. 1987 , Russia's Second Revolution: the February 1917 Uprising in Petrograd, translated by Donald J Raleigh, Bloomington: Indiana University Press. Corney, Frederick C. (ed.) 2016, Trotsky's Challenge: the “Literary Discussion” of 1924 and the Fight for the Bolshevik Revolution, Leiden, Boston: Brill. Dickins, Alistair 2017, ‘A Revolution in March: the Overthrow of Tsarism in Krasnoiarsk’, Historical Research, 90, 247: 11-31. Elwood, Ralph Carter (ed.) 1974, Resolutions and Decisions of the Communist Party of the Soviet Union. Volume 1, The Russian Social Democratic Labour Party, 1898–October 1917, Toronto: University of Toronto Press. Ferro, Marc 1972, The Russian Revolution of February 1917, translated by J. L. Richards, Englewood Cliffs: Prentice-Hall. Galili y Garcia, Ziva 1989, The Menshevik Leaders in the Russian Revolution: Social Realities and Political Strategies, Princeton, N.J.: Princeton University Press. Gērmanis, Uldis 1974, Oberst Vācietis und die lettischen Schützen im Weltkrieg und in der Oktoberrevolution, Stockholm: Almqvist och Wiksell. Hasegawa, Tsuyoshi 1981, The February Revolution, Petrograd, 1917, Seattle: University of Washington Press. Lih, Lars T. 2014, ‘Fully Armed: Kamenev and Pravda in March 1917’, The NEP Era: Soviet Russia 1921-1928, 8: 55-68. Mandel, David 1983, The Petrograd Workers and the Fall of the Old Regime: from the February Revolution to the July Days, 1917, New York: St. Martin's Press. Манилова, В. 1928, 1917 год на Киевщине: хроника событий, Киев: Гос. изд-во Украины. Marot, John 2014, ‘Lenin, Bolshevism, and Social-Democratic Political Theory: The 1905 and 1917 Soviets’, Historical Materialism, 22, 3–4: 129–171. Melancon, Michael S. 2009, ‘From the Head of Zeus: the Petrograd Soviet's Rise and First days, 27 February – 2 March 1917’, The Carl Beck Papers in Russian & East European Studies, Number 2004, Pittsburgh: Center for Russian and East European Studies, University Centre for International Studies, University of Pittsburgh. Phillips, Hugh 2001, ‘The Heartland Turns Red: The Bolshevik Seizure of Power in Tver’, Revolutionary Russia, 14, 1: 1-21. РСДРП (большевиков) 1958 , Седьмая (апрельская) Всероссийская конференция РСДРП (большевиков); Петроградская общегородская конференция РСДРП (большевиков). Апрель 1917 года. Протоколы, Москва: Госполитиздат. Service, Robert 1979, The Bolshevik Party in Revolution: a Study in Organisational Change, 1917-1923, New York: Barnes Noble Books. Шляпников, А. Г. 1992 , Семнадцатый год, Москва: Республика. Slusser, Robert M. 1987, Stalin in October: the Man who Missed the Revolution, Baltimore: Johns Hopkins University Press. Sukhanov, N.N. 1955 , The Russian Revolution, 1917: a Personal Record, edited and translated by Joel Carmichael, London, New York: Oxford University Press. Trotsky, Leon 2016 , ‘The Lessons of October’ in Trotsky's Challenge: the “Literary Discussion” of 1924 and the Fight for the Bolshevik Revolution, edited by Frederick C. Corney, Leiden, Boston: Brill. Trotsky 2016 , p. 92. Trotsky 2016 , pp. 92, 95. Trotsky 2016 , p. 96. Challenging Trotsky’s interpretation of early 1917 neither requires rejecting the strategy of permanent revolution, nor accepting Stalinist accounts of 1917. In subsequent articles, I will show that despite the limitations in his interpretation of pre-Lenin Bolshevism, on the whole the politics of the party in 1917, and the course of the revolution, confirm the fundamental political tenets of permanent revolution. 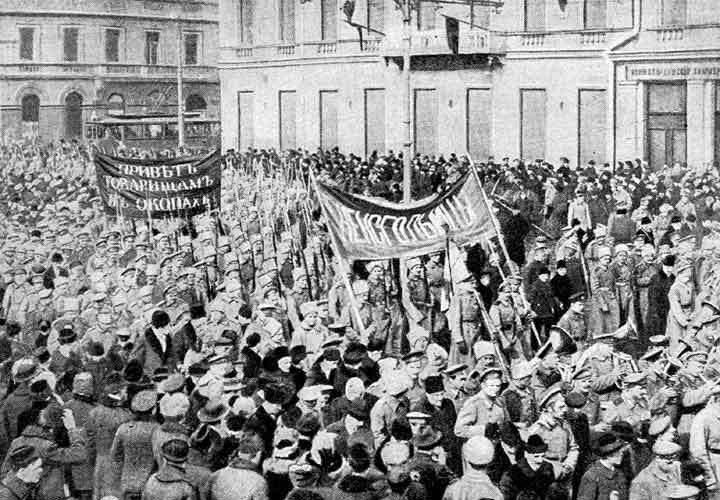 In The Lessons of October Trotsky skips over the politics of the Bolsheviks in the February Revolution, limiting his discussion of pre-Lenin Bolshevism to March. Though his assertions cited above specifically pertain to the period directly following the downfall of the Tsar (and thus will be directly addressed in our next article), the ideas and actions of Bolsheviks in February are a necessary starting point for understanding the ensuing developments. Subsequent articles will then address Bolshevik conceptions of socialist revolution and their views on the state (Soviet power, a Constituent Assembly, etc.) in 1917. The role of the Bolsheviks empirewide in 1917 is covered in my forthcoming monograph, Anti-Colonial Marxism: Oppression & Revolution in the Tsarist Borderlands (Brill–Historical Materialism Book Series). ‘The Bolshevik Manifesto of February 1917’ [27 February, 1917], in Ferro 1972, p. 345. Cited in Melancon 1988, p. 489. Hasegawa and most historians attribute the leaflet to the Bolshevik Vyborg Committee. (Hasegawa 1981, p. 333.) Melancon has countered that it was most likely issued jointly by the ‘Interdistrict’ group of the RSDRP, the Bolsheviks, and the anarchists. (Melancon 1988, p. 489.) This controversy matters little for our discussion, since all sources agree that the Vyborg Committee of the Bolsheviks openly argued in favour of the creation of a soviet government from 25 February onwards. ‘Резолюция о текущем моменте’ [8 March, 1917] in Манилова 1928, pp. 167-68. Cited in Burdzhalov 1987 , p. 82. Sukhanov, N.N. 1955 , p. 103. Emphasis in the original. On the conflicts between the Vyborg Committee and the Russian Bureau, see, for example, Hasegawa 1981, pp. 258, 536–37. Шляпников 1992 , pp. 90, 102. Sukhanov 1955 , pp. 59, 103–04, 107-8; Hasegawa 1981, p. 412-13; Melancon 2009, p. 44. Melancon notes some of the lacunae in the sources concerning what exactly was raised at the 1 March meeting. Sukhanov 1955 , pp. 59, 103–04. Sukhanov 1955 , pp. 137-38; Melancon 2009. Cited in Burdzhalov 1987 , p. 242. Galili y Garcia 1989, p. 66. Cited in Hasegawa 1981, p. 541. Cited in Melancon 2009, p. 46. Cited in Hasegawa 1981, p. 543. Ibid. On the factual inaccuracies of Soviet historiographic accounts of the 2 March meeting (many of which have subsequently found their way into the non-Russian literature), see Melancon 2009, p. 73. Шляпников 1992 , pp. 217-18, 230. Cited in Mandel 1983, p. 83. Cited in Gērmanis, 1974. p. 143. Шляпников 1992 , pp. 161, 181, 216. Шляпников 1992 , pp. 66, 165. Шляпников 1992 , pp. 196. Шляпников 1992 , p. 216. This development is detailed in Lars Lih’s important forthcoming publication on Bolshevik discussions in April. РСДРП (большевиков) 1958 , p. 18. Cited in Hasegawa 1981, p. 424.